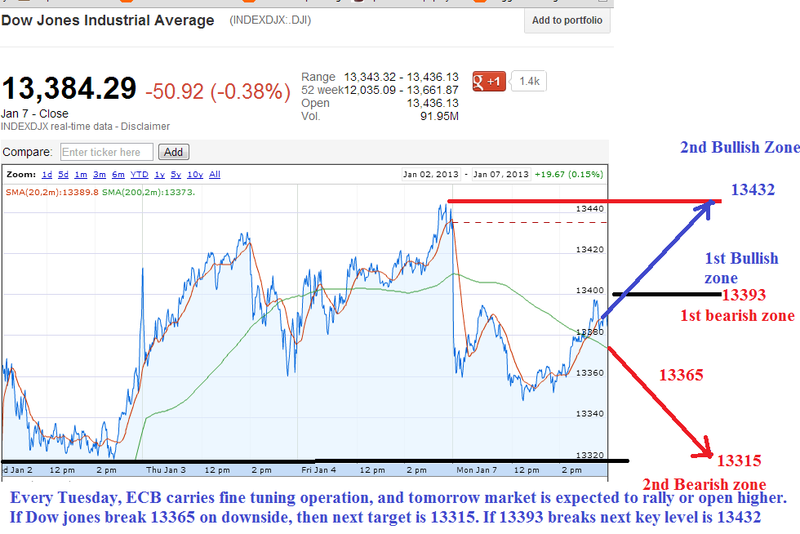 Stock market is expected to open higher or rally tomorrow because its ECB fine tuning day. 80% of the time market have rallied or opened higher because of this operation. So don't be surprise if market rallies for no reason. Key level on the downside is 13365 for bear. The only economic data that is important is US consumer credit at 3 pm EST though It doesn't cause major movement. Earning season begins from tomorrow and the first one to report is AA. Next key event this week will be ECB rate cut decision on Thursday. So no major movement is is expected. Market is expected to remain flat to slightly lower till then. 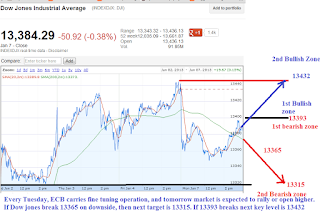 Dow Jones is expected to open because if ECB fine tuning day. 13365 is key level on downside, while 13432 is key level on upside.